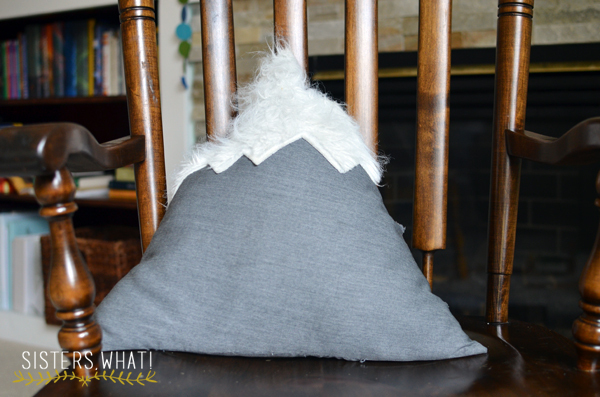 ' Mountain Pillow sewing tutorial - Sisters, What! 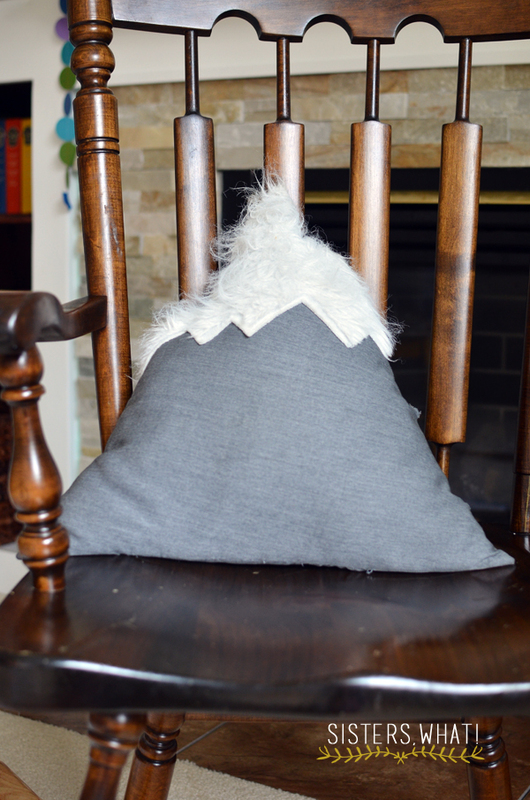 I've been meaning to share this mountain pillow for while now (like 2 years) but I just keep forgetting, and since I just shared my potato stamped plus sign pillow, I figured now is as good as time as any. 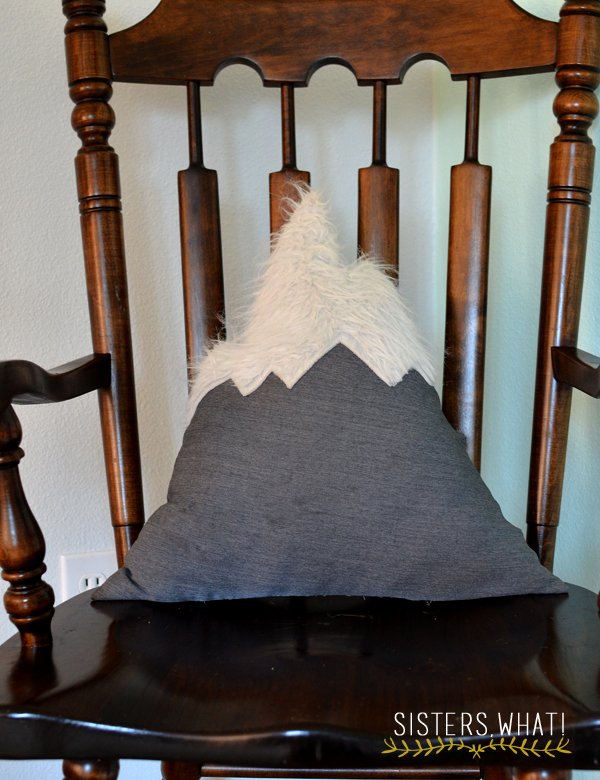 I came across Design Sponge's mountain pillow tutorial a couple year ago and just knew I needed to make one. My husband loves mountains and we were living far away from mountains at the time so it just seemed the perfect gift. He loved it, but I think it is used more for pillow fights then snuggling on. Just before he throws the pillow at me or the little ones, he'll give us a two second warn with "mountain attack!" Needless to say, the little ones LOVE the mountain pillow just as much as him. 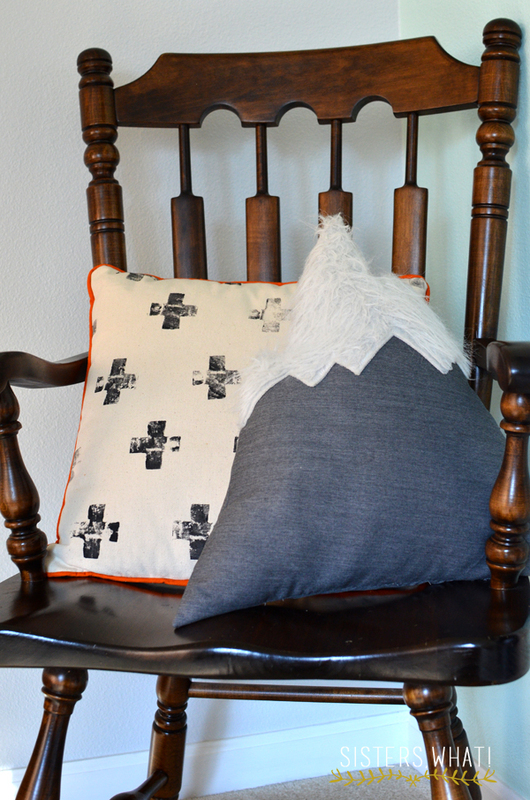 And here it is with the potato stamped plus sign pillow in case you missed that post. bah! this is just darling! Ooooh, i'm so inspired! These would be darling in a nursery (or just about anywhere)! A nursery would be perfect. I know! The fur is my favorite part. This is so much fun! It would be so great in a lodge-inspired den. Yes it would be perfect! I love, love, love this pillow - now I really think that there is now way around learning how to sew. Thank you! Thank you! Learning to sew is totally worth it! That pillow is super cute! Thanks for linking up with us! How cute! I never thought about making pillows in different shapes! Thanks for linking up with What's Up Wednesday! This is so cute! I need one of those on my couch pronto. Thanks so much for linking up with us on What's Up Wednesday! Hope to see you there again! This is so cute and creative! I'm moving the end of this year and have been collecting some DIY throw pillow ideas because they are so expensive to buy. Thanks for sharing this with Hump Day Happenings. I know, pillows can be SO expensive! I say anything goes with pillows. Gorgeous! I was just looking at making one very similar to this last week! I think I'll have to get the sewing machine out now!